Don’t miss this film about a magazine produced in the trenches for those unlucky enough to be there too. The trenches are those occupied by the British in the First World War. All the horrors we know about are shown: mud; gas; wire; fear; death; but there’s also humour – real, defiant humour – The Wipers Times. 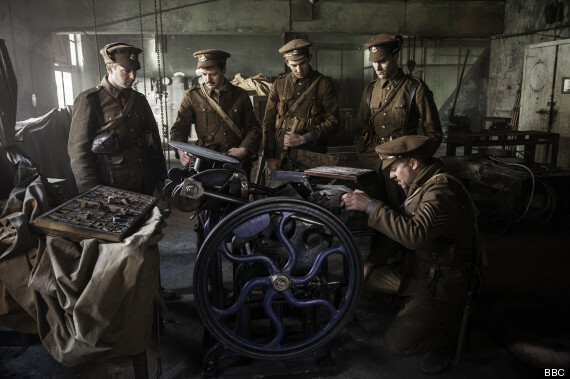 The film is a ninety minute true story about The Wipers Times named, in the British way, after Ypres. The publication is produced under unhelpful bombardment in the trenches from Ypres to the Somme and back. The editor of the magazine is Captain Fred Roberts of the 12th Battalion of the Sherwood Foresters (played by Ben Chaplin), and his sub-editor is Lieutenant Jack Pearson (Julian Rhind-Tutt). Neither have any journalistic experience. It is chance that drags them through the mud to the editorial suite of The Wipers Times … more mud, more alcohol, and plenty of bangs . The chance comes about in 1916 when the men are on the hunt for trench improvement materials in Ypres. Whilst digging around in a battered building they find a printing press, supplies of paper and the printing skills of their sergeant, previously from Fleet Street. The fuse for the The Wipers Times is lit and stays alight despite the extreme conditions. The men love it but some of the senior ranks, especially the staff, are enraged at its cheek. Censorship bombs are a real threat but never quite hit their target. The printing press is not so lucky. It’s destroyed by a direct hit from the Germans but a replacement is found in the mayhem around another corner. Writers Ian Hislop (editor of Private Eye) and Nick Newman, and director Andy de Emmony, present the situation with pace. It is bitter, gentle, brutal and funny. It makes you cheer for hope and soul in the face of the awful. The paper’s content – its advertisements, poems and editorials – is sketched into the film by way of asides that slip in seamlessly taking us inside the minds inside the trenches. They show us the humour – where it comes from and where it’s going. Captain Roberts comes across as intense. He is determined, despite the odds, to hang on to the lighter side and his publication. There is no doubting that he is the right man for the job. He survives gas and ‘going over the top’ at the Somme. As if to prove our judgement right we learn that he is to be awarded the Military Cross for Gallantry, and that both he and Lieutenant Jack Pearson MC DSO (Distinguished Service Order) survive the war. The Wipers Times is a hopeful, spirited 90 minutes that powers around the English language and the boundaries of the word ‘offensive’. To me it is creative genius – a mind-warmer from dark times for better times. If you missed The Wipers Times on BBC2 this week it is on iPlayer for another five days. This entry was posted in First World War, Reviews, Television and tagged First World War, Fred Roberts, humour, Ian Hislop, Jack Pearson, military cross for gallantry, Sherwood Foresters, The Wipers Times, trenches. Bookmark the permalink. Hello there. Seeing as how you’ve written this excellent article on The Wipers Times, I was wondering whether you would have a look at my article and see what you make of it. Thought your piece was great – have posted a comment on your blog.